MANILA -- Members of the Duterte Cabinet are on the ground in areas affected by Typhoon Ompong to respond to the needs of residents and give updates on the government’s emergency response. “The directive is to conduct this (command conference). We were tasked to handle dissemination. 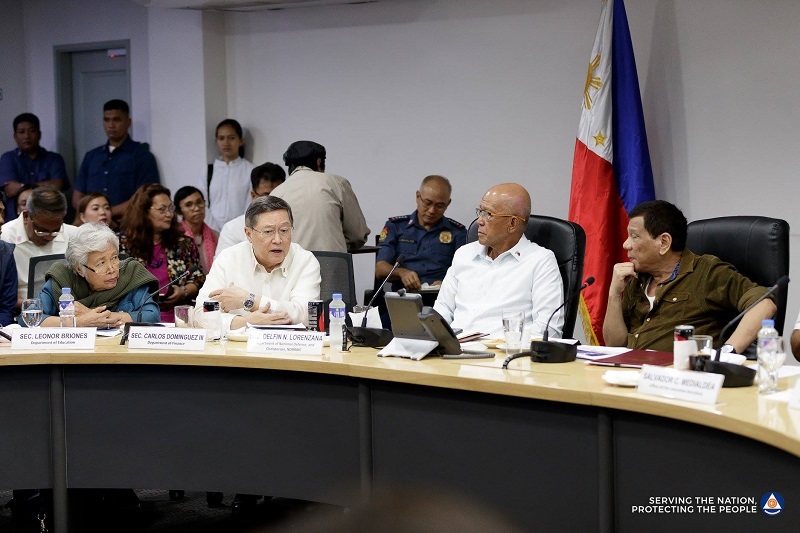 The Ilocanos in the Cabinet were tasked to go to their respective home provinces,” Presidential Spokesperson Harry Roque said in a press briefing at the National Disaster Risk Reduction and Management Council (NDRRMC) headquarters in Quezon City on Saturday. “The presence of the alter egos of the President, I think, has been beneficial because everyone, as far as the line agencies of the government (are concerned), are directly reporting to them now and going around, ensuring that we are at our best as far as disaster preparedness is concerned,” he added. Roque said Political Adviser Francis Tolentino is in Cagayan, Transportation Secretary Arthur Tugade in Tuguegarao, and Labor Secretary Silvestre Bello III in Isabela to monitor the current situation in their respective areas. According to Tolentino, there was no report of casualties as of posting time but an increased number of evacuees was reported in affected areas. Tugade said the Tuguegarao Airport was closed to the public after some facilities were damaged due to the typhoon. Defense Secretary Delfin Lorenzana, who joined Roque in the press conference, clarified that although some facilities were damaged, it was still open for humanitarian services. “The facilities are damaged but the runway itself is okay. The runway can be used for humanitarian services,” Lorenzana said. Bello, meanwhile, said roads from Metro Manila to Cagayan remain passable and communication signal remains strong. However, there is reported damage on agricultural products in Cagayan, he said. He also assured that relief goods and donations were arriving in affected areas. Energy Secretary Alfonso Cusi said although power outages in some affected areas were reported, the government is working to partially restore them. Trade Secretary Ramon Lopez said his department has set up command centers to ensure the flow of basic commodities, while Social Welfare Acting Secretary Virginia Orogo said 31,631 families in the llocos, Cagayan Valley, Central Luzon and Cordillera regions have been affected by the typhoon, and many of them were already in evacuation centers.